An outbreak of spring bunnies that allegedly caused property damage in Bellevue has apparently been brought under control, yet some remain at large. The rabbits seem to have escaped from a domestic enclosure, gobbling up gardens and digging holes in lawns. It is uncertain how native cottontail rabbits in the neighborhood are dealing with the competition. Bellevue Marshal Larry Clark responded to an anonymous complaint this spring, from a resident who said the escaped rabbits were wrecking his garden. “I saw one rabbit at the corner of Fifth and Elm Streets. It was bigger than a wild one, and a little darker,” Clark said. Clark inspected a rabbit pen in the neighborhood and found it to be sound enough to prevent escape, and issued no warnings or citations for rabbits at large. “I can’t issue a warning to someone who no longer owns the rabbit. It would be a matter of proving who let the rabbit go. And I do not have the manpower to trap rabbits,” Clark said. 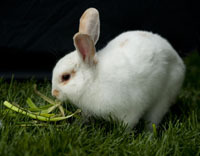 The city of Bellevue has no laws regarding escaped rabbits, but Idaho homeowners are allowed to use lethal force against animals to protect property. One neighborhood resident, who asked to remain unidentified, said he used a spray of coyote blood and spices on his flowerbed in order to deter the hungry rabbits from eating his landscaping. He said trapping efforts undertaken by his neighbors seem to have succeeded in bringing the problem under control. “There were quite a few in the neighborhood a month ago and they mostly seem to have gone away,” he said. One Bellevue resident said he is concerned that the fast-breeding domestic rabbits could push the cottontails out of the area. He said at least two of them have been killed by dogs, and left on his neighbor’s lawn. He said if the rabbits continue to expand into new territory, he fears they could draw foxes and coyotes into town. There already have been reports of a mountain lion near Bellevue Elementary School. His children and neighbor kids have conducted routine evening bunny catches, armed with fishing nets and headlamps, and arms aching to cuddle. The kids aren’t near as fast as the bunnies though, and only caught two have been caught in four months. One enjoyed a few days pampering until it tunneled out of the pen, the other is named Smore, and is looking for a home. “The whole thing has been as fun and exhausting as it has been educational,” he said. “The kids rallied to find them first and to establish a bunny shelter so others wouldn’t kill them. And, they do consult with a vet and their 4H leader as well. Bellevue resident Freddie Harris said she began noticing a tall white rabbit on the corner of Fourth and Elm streets a few weeks ago. “It sits there on the same corner every evening when I am coming home. I tried walking up to him but he hid under a car, and then started running around in circles,” she said. “Right now he fancies himself a wild rabbit."